Not every business place which has suffered from the ravages of two major storms (Tropical Storm Erika 2015 and then Hurricane Maria in 2017) would have still been opened for business today in 2019. However, DCP, formerly Dominica Colgate Palmolive now DCP Successors Limited, has withstood the test of time and is open doing business with the local and regional market. Damien Sorhaindo is the general manager of the company and speaking to the SUN in an exclusive interview, explained that the company was acquired Colgate Palmolive in May 2017 and they were in the process of rehabilitating the company, which suffered millions of dollars in damages after Tropical Storm Erika, but then came Hurricane Maria. "We had a time line of six months to do complete rehabilitation works but unfortunately just before we had our planned first production run we were struck by Hurricane Maria and that set us back another four to five months before we could officially startup operations. Also, because of the significant damages we suffered after Maria, we had to deviate a lot of our cash into repairs to ensure that we got back up and running," Sorhaindo said. He continued: "The good thing about Hurricane Maria, as compared to TS Erika, is that the internal factory was not flooded, and as a result, a lot of the repairs that were made to the Plant equipment were not impacted. However, because of the major clean up and the electrical and other infrastructural damage caused by Maria, we could not start operations until February 2018." Sorhaindo is no stranger to the company and its staff, having worked there for a number of years with DCP and Colgate Palmolive, he then moved on to the United States with Colgate-Palmolive for another three years, then moved back to the region working in the field of trade promotion and export development before returning to Dominica in 2017 and accepting the post as general manager of the newly acquired company. He revealed that along with the regional investors, who invested in the company, it was partly financed with a Citizen By Investment (CBI) loan by the Government of Dominica and "we really want to extend our gratitude to the Government for that". "I must tell you that the market is very challenging since we are coming in with entirely new brands because we don't have the license for the former brands of DCP and or Colgate Palmolive, so we are basically competing with some of our former established brands with what everyone would have become familiar with in the region. However, it is a challenge that the company and its staff is up for," he said. According to Sorhaindo: "Presently, on average we ship about two and a half to three 20 foot containers a month out of Dominica. This month (February) has been a particularly good one where we are on track to export four and a half containers and we are working towards securing additional markets and volumes within our existing markets to increase this number in the coming months." He continued: "We are currently exporting to 13 countries in CARICOM, we are going as far south as Suriname to as far north as Jamaica, including all the OECS islands along with Guyana, St. Maarten, and the USVI. We have also done a small test shipment to a distributor in the United States. Presently, we are looking to access additional markets like Cuba and the Dominican Republic which is a huge market with a combined population combined of 20 million. That could be a game changer for the company." The local market, Sorhaindo said, is "a small market in the big scheme of things" with local sales being about ten percent of their total sales but they are doing all they can locally as well. The company recently launched a line of hotel amenities. "We have a full line of hotel amenities under the Mabrika brand, which includes a 25g and 45g soap, along with shampoo, conditioner, bath gel, 2 n 1 Shampoo and conditioner, and a body lotion. We currently don't have the ability to produce liquid products in house so we get it contract manufactured in Jamaica and re-export in to the CARICOM market," Sorhaindo said. The brands that DCPS is currently carrying are the BETTA BLU and TRU BLU laundry soaps, the Reddy Carbolic soap which the company is also exporting and soon, he said, they are going to do a line extension for the REDDY brand and are also working on a more premium brand which will be launched later this year. "So we are now trying to grow our volumes in the markets which we are servicing. We have 32 full time staff and three part time and are running one shift a day with the hopes of being able to add on additional shifts and hiring more staff once we see significant growth in our volumes," he said. 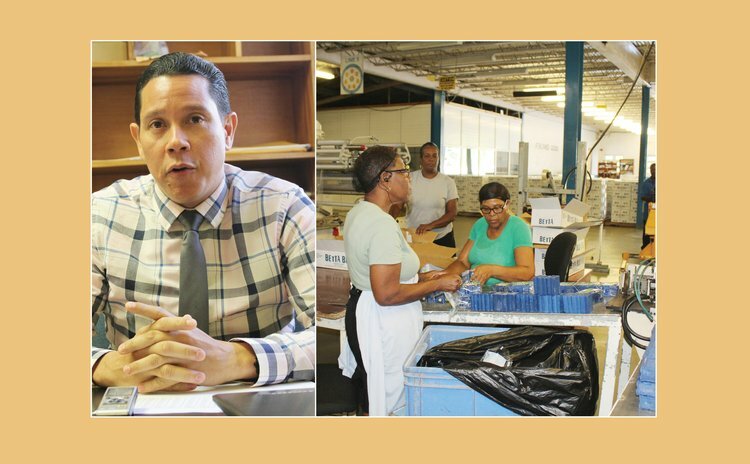 Sorhaindo is calling on business places and the public both locally and regionally to "rally round this company, go out and support the brand, be brand ambassadors for the company, as we need more manufacturing on the island, especially in the wake of the aftermath of Hurricane Maria". He stressed the importance of this business entity to Dominica's economy in bringing in much needed foreign exchange earnings, as well as helping to generate increased employment, particularly for staff who were displaced after the closure of the factory in 2015 and 2017 due to the storms.